Summary: In this post I present a change tactic to help executive management see the value of their company’s enterprise social network without risk and time commitment. Many employees only know the name of their CEO and that he probably earns lots of money. That is not much to trust him as a leader. In large traditional organisations the executive management is often far removed from the workforce. Once a year the company might hold a town-hall meeting, at which the management team lays out the company’s strategy and answers employees‘ questions. The rest of the year the Internal Communication department prepares and distributes updates on behalf of the management team. Thus, in traditional organisations there is hardly any interaction and communication between the executive management and workforce leading to misunderstandings, mistrust and potentially disengagement. How do managers expect employees to trust and follow them if they don’t know them? An enterprise social network or similar can help bridge the (communication) void between management and employees by ‚working out loud‚. In a previous blog post I talked about why managers, including executive managers, should be using such platforms. There are many others that highlight the necessity of the C-Suite to become ’social‘ (aka connected!). In a recent post I also wrote about very concrete first steps for managers to get started with a company’s enterprise social network. And yet, some managers may still refuse to use such platforms actively, partly because of different reasons or excuses, e.g. lack of time, unable to see the value or other higher priorities. But rather than just giving up, maybe there is something that can be done to ’nudge‘ executive management and accelerate the necessary change? Two ideas that go into this direction are ‚Ask Me Anything‚ by John Stepper of Deutsche Bank and ‚Open up the corporate ivory towers‚ by Daniel Martin Eckhart of Swiss Re. In both cases the goal is to make executive management more accessible and certain decisions taken by them more transparent. The initial investment taken by the management is low, but the value that can be shown is high. Based on a similar thinking there is a change tactic I call ‚One day in the life of…‘. The title is actually inspired by Aleksandr Solzhenitsyn’s novel ‚One Day in the Life of Ivan Denisovich‘. Thanks to Solzhenitsyn and his remarkably detailed narration, the reader can get a sense of the inhumanity and brutality that inmates of the Gulag prison camps suffered. Whilst many of them were not able to speak out, Solzhenitsyn gave them a powerful voice in his book. ‚One day in the life of…‘ in a corporate setting is (hopefully) taking place in a different context ;). The idea is to open up a world to people which they usually don’t have access to. It can provide a glimpse into the demanding but interesting day of people that employees know the name of but not much more than that. This builds trust and probably to a certain extent understanding of why certain decisions are taken. How can ‚One day in the life of…‘ work? It should be set up as a campaign supported by proper communication and also educational elements, since it is not meant to be done just for the fun of it but to help people adopt new behaviours and tools! One employee is selected to follow a senior manager or C-Suite member for one day to meetings, lunch, events (whatever is on the schedule). The employee uses the company’s enterprise social network or Intranet during the day to keep other employees updated obviously leaving out any confidential information. It needs to be ensured though that there is no censorship by anyone, otherwise the communication becomes inauthentic and not trust-worthy and is perceived as yet-some-other-internal-comms content. The employee can use #hashtags to update his status, so others can follow the conversation, ask questions or ask the employee to ask certain questions to the senior manager or C-Suite leader. Since asking a question on the enterprise social network or Intranet is in most cases not anonymous, it can be assumed that there won’t be any difficult or inappropriate questions. Quite the opposite, it might be difficult to get people to post questions. That is why it is important to facilitate this process carefully. What does the manager gain? Well, let me ask you: ‚What does the manager stand to lose?‚ A skeptical manager can experience the power of using such platforms with very low (time) investment. There is not much he needs to change in his daily schedule if anything. At the same time he can get to know the platform and how he could use it himself. It’s a supervised learning by doing exercise. More importantly though, the manager might be able to earn higher trust, credibility and better understanding among employees. And hopefully, the next time he will use the tool himself to keep his employees informed of what he is doing by ‚working out loud‘. Of course, this idea is also valuable for further increasing the use and reputation of the company’s enterprise social network or Intranet. Thus, a win-win for all! Enterprise social platforms allow for and at the same time require new behaviours. It is a learning process. However, sometimes traditional learning formats like videos, presentation, brown-bag lunches etc. are simply not sufficient to help with the first steps. If your managers and employees don’t see the value or don’t know how to use these tools for their own benefit, it’s time to explore new ways of learning and helping them to get started! Summary: Moving ‚from company centric design to user centric design‘ is the eight corporate website trend we identified. This post is part of a series of blog posts in which we look at trends for corporate websites. This trend does certainly not only apply to corporate websites. In fact, this applies to any product or service in this world. To be successful any product or service needs to be useful, usable, delightful and accessible. You may want to add affordable, but in the end people are willing to pay a premium if the aforementioned product or service characteristics are fulfilled. 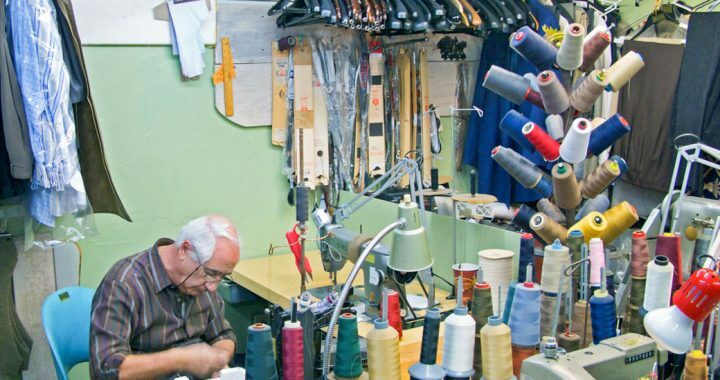 Useful – is one of the key characteristics to make a product or service successful. In the past, product and service providers often assumed that they would know what their users wanted. Even worse, in some cases providers never even had an interest in why and how users would use their products or services. Look at Enterprise IT. Most systems are completely unuseful and unusable! This is changing. 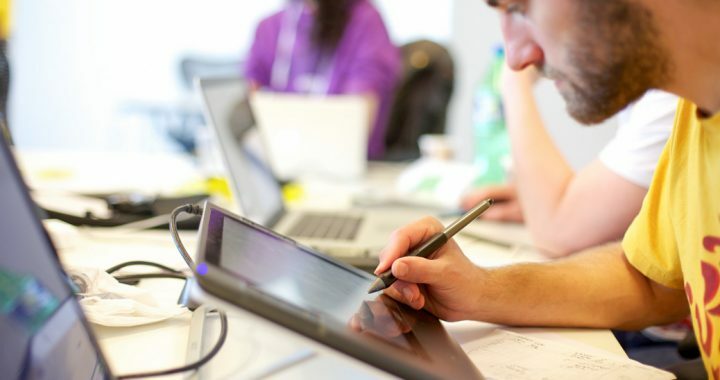 New disciplines like User Experience Design have emerged. It goes way beyond traditional visual design and usability approaches, as it places the user with all his needs and behaviour at the very centre. The same is true for service design, which follows similar customer centric principles. What does this all mean when you consider relaunching your corporate website? In previous blog posts of this series I mentioned a number of interesting examples from companies and how they have implemented the various corporate website trends. These example may make sense to those companies and their audience, but maybe not for you. Therefore, user research has become a critical component in developing new products and services. There are different methods of user research from surveys and interviews to focus groups or even observing representatives of your target audience. One of the most common and scalable approaches are anonymous surveys like the one from HP below. Designing surveys is a science in itself. 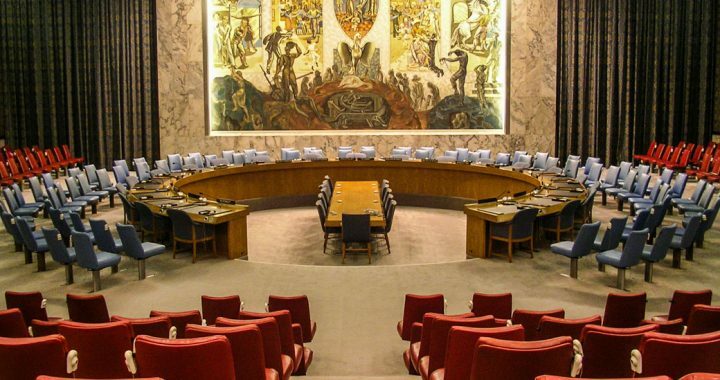 You will need to evaluate the number of questions, the conclusions that can be drawn from the answers, the time people are willing to spare to participate and many other factors. Many survey providers offer packages including for surveying visitors to corporate websites. This should help to get you on the right track and you can build from there. An anonymous survey is something that scales nicely, is affordable and depending on the design of the survey and overall number of visitors can provide you with supporting data points. It will hardly be the case though that insights gained from the survey will drastically impact your strategy or functionality. It can either be used on an ongoing basis to capture feedback and learn about potential improvements or for the relaunch of the corporate website to gather additional data points to support initial assumptions. Interviews are another research method that allow you to go deeper on needs and behaviours of your target audience. It may sound strange at first to want to interview journalists, analysts or CSR professionals. Besides, you may refrain from doing so, because everyone is extremely busy. That is true. But most people can spare 10-15 min, especially if you already have a connection with them (e.g. journalists that cover your company often). They feel valued that you ask them for their opinion. And in the end their time might be excellent invested, as the new corporate website should help them in their job. Thus, a win-win situation. Best to label the interview as a conversation and ideally pick it up when you need to talk to the other person anyway. What is highly important though is that you do not ask ‚What functionality would you like?‘. It’s a hit and miss. Better to allow your conversation partner to explain how they work. If it is a journalist, how does he get ideas for stories? How do they decide which story is worthwhile writing? How do they research the story? Of course you can also ask what they like/dislike about your website or what other corporate website they like. Similar for other audiences like analysts and investors, CSR professionals, career seekers, consumers etc. What you really want to understand is their way of working and where you could imagine functionality to improve their way of working and interaction with you and your company (including through the corporate website). From that insight you can derive relevant functionality and design the experience the way it makes sense to the user. Summary: Moving ‚from providing information to providing a service‘ is the seventh corporate website trend we identified. This post is part of a series of blog posts in which we look at trends for corporate websites. Most corporate websites provide large amounts of information. This used to be enough, but no longer. If you want to be useful and build trust that way you need to offer additional value through other services. Especially on a corporate site people are usually on a mission to accomplish a task. They rarely visit a corporate site to simply browse and enjoy some nice imagery. Sometimes providing a service as an added value can seem counter-intuitive, as it initially may not support the organization’s objectives. However, one of the maxims in a connected world states: Provide more value than you can capture. The idea is that people will thank you for your services and talk about them / you in favorable ways, which again, in a connected world is critical. I found a very interesting take on this trend implemented by BP. On their corporate website they provide an Energy Usage and Carbon Emission Calculator. It’s a nifty tool that allows you to measure your energy consumption. It also uses some lightweight game mechanics, since you can compare your consumption against the average consumer. BP also offers you to send a reminder in the future to use the calculator again and track and compare your energy consumption. It’s a very easy way to stay in touch and on the minds of consumers. Last but not least, the BP Energy Lab provides tips for greener more sustainable living. Even though it is all tucked away in the Sustainability section of BP’s website, you have to applaud the company on thinking beyond providing information to now also providing a service. I think there are lots of opportunities for companies, even traditional B2B companies, that have not been explored yet. 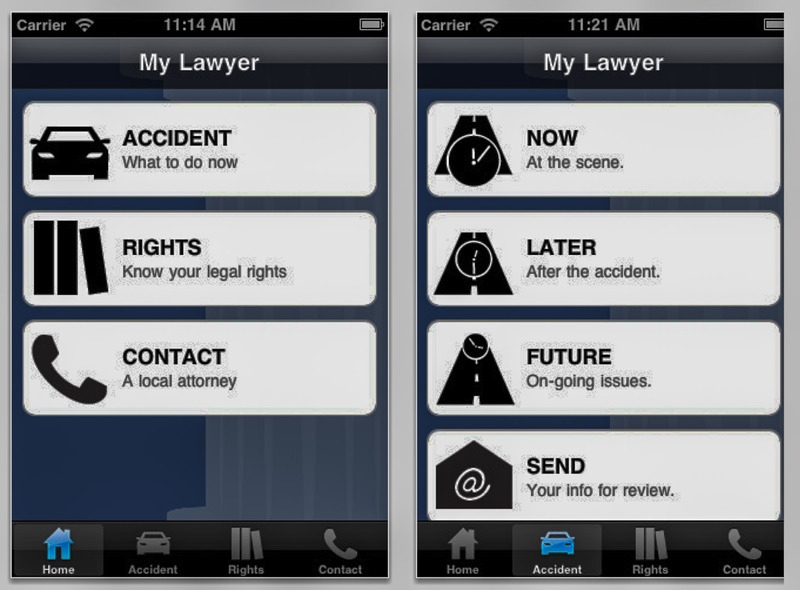 Whilst not a corporate website per se, one highly interesting example I came across was a mobile app developed by a law firm specialized in car accidents. Similar to other law firms, the company could have simply created a mobile app providing information and news about the firm. But they must have known that few people will actually download the app, as its use is very limited! Instead the firm thought beyond providing information to providing a service. The app helps people involved in an accident. It provides a checklist of what to do, provides the functionality to record conversations with police and the other party, draw a sketch of how the accident happened, record GPS location and many other things. All through this process, there is no value for the law firm. However, when the person involved in the accident has gathered all the information using the app, he can simply send it to the law firm. That is where the loop closes. But there are other examples of how companies are moving from providing information to providing a service, which can also go beyond the corporate website. In the end, it’s not the channel that counts, but the wider mindshift that is involved and effects all parts of the business. Below are just two examples of companies that are also riding this trend. BASF has a number of mobile apps. Below is a screenshot of an app that helps arable farmers and agronomists identifying diseases in cereals. Unilever created a mobile app targeting students and recent graduates. The Unilever Career Sprinter app obviously provides career information about Unilever but also general job tips that could be useful for their target audience. The app was last updated in November 2012, so I am not sure how successful it really was in the end. It might well be that it will get pulled from the App Store soon. These are all first steps in moving towards providing services. In the future we might see new scenarios and functionality. Imagine a journalist looking for different views on a company story. Of course, the journalist can use all the different search engines and channels, but what if he could go to the corporate website and see the corporate communication and the non-corporate communication about the topic? Would it be helpful in that it would save him time and that it would provide the journalist with valuable context? It probably would. The same is true for investors that are looking at a company. Why not aggregate and provide information in an effective way about how the company is faring against the wider market or even competitors? The investor will find that information anyway, so why not help him accomplish his task faster? Companies may not see an immediate ROI and thus refrain from this kind of strategy. But they should remember that we live in a networked world and things have changed. Business as usual is not an option anymore. Summary: Moving ‚from destination to platform‘ is the sixth corporate website trend we identified. This post is part of a series of blog posts in which we look at trends for corporate websites. The Web is a platform. Facebook is a platform. Why not the corporate website? At the moment, most corporate websites simply serve as a destination. People looking to accomplish something visit the website, (hopefully) complete their task and leave. In most cases the website is not a place where like-minded people are able to connect with each other. Much thought and consideration is needed for extending a corporate website to become a platform, especially if the main audience consists of journalists, investors, CSR professionals and career seekers. You will need to come up with well defined use cases and reasons for the audience to engage and connect with each other. 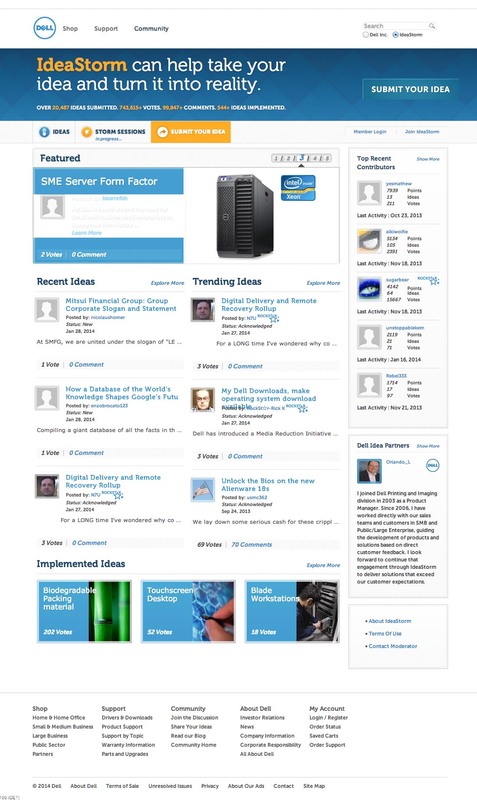 HP provides access to its consumer and enterprise support forums through its corporate website. The forums run on a different platform – Lithium. Lithium is a well-known provider for (external) communities. 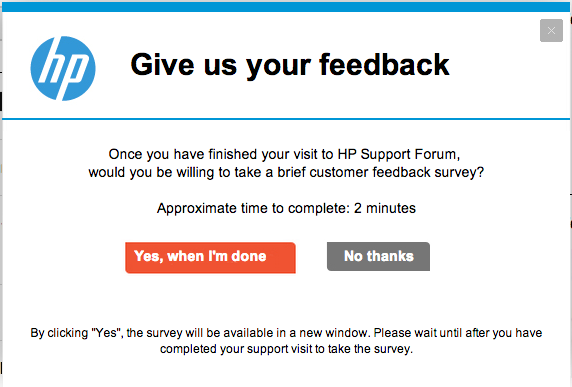 Interestingly, HP have applied the corporate look&feel to the support forums making it a seamless experience for users. 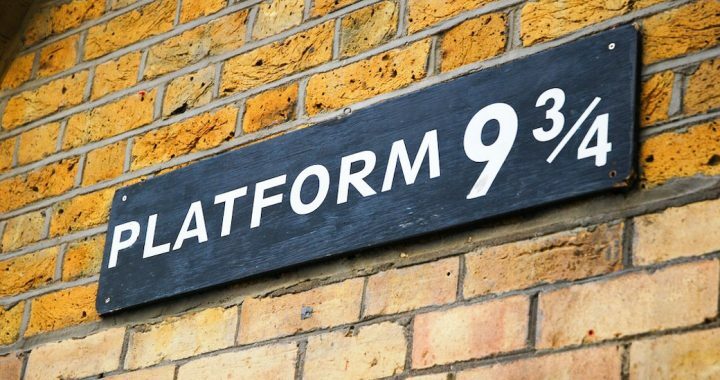 HP might think about a deeper integration with content from other parts of the corporate website. For example, users of the forums have at least some degree of HP product knowledge. Many are even experts in their field. If HP want to attract those talented people, why not display job adverts somewhere on the support forums (see similar General Electric that advertises the number of open positions on their homepage) or target those people directly? 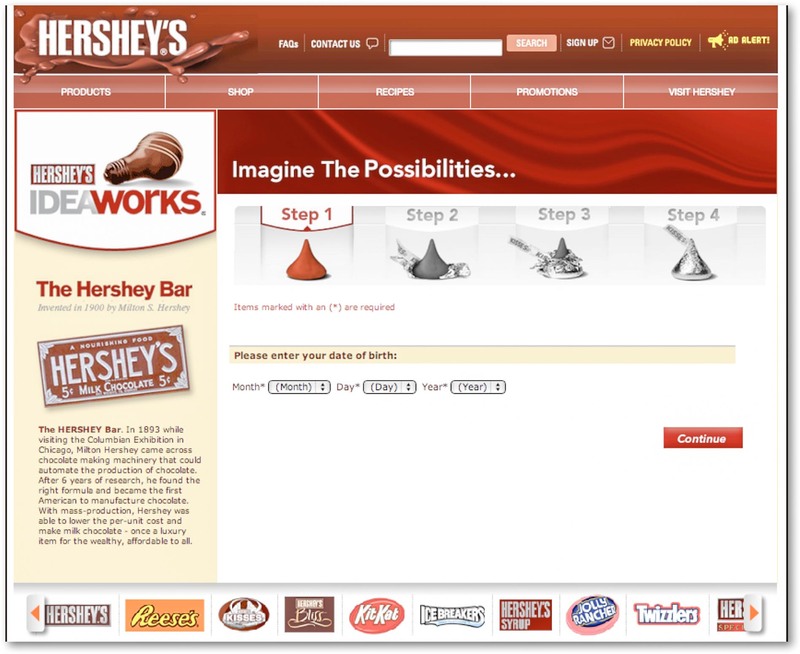 Hershey’s has integrated a crowd-sourcing application that lets users share ideas about new products, packaging and technology. I am not sure how successful this process is given the intimidating language and terms. It also fails to involve a wider audience by allowing them to review, like, vote or comment on submitted ideas by others. In the end it feels like a slightly more advanced ‚Suggestion Box‘. Dell with its IdeaStorm has made a better implementation of what I mentioned above. It is a sustainable and successful crowd-sourcing initiative. Whilst it is not integrated into the corporate website, it is a primary example of running such crowd-sourcing projects. 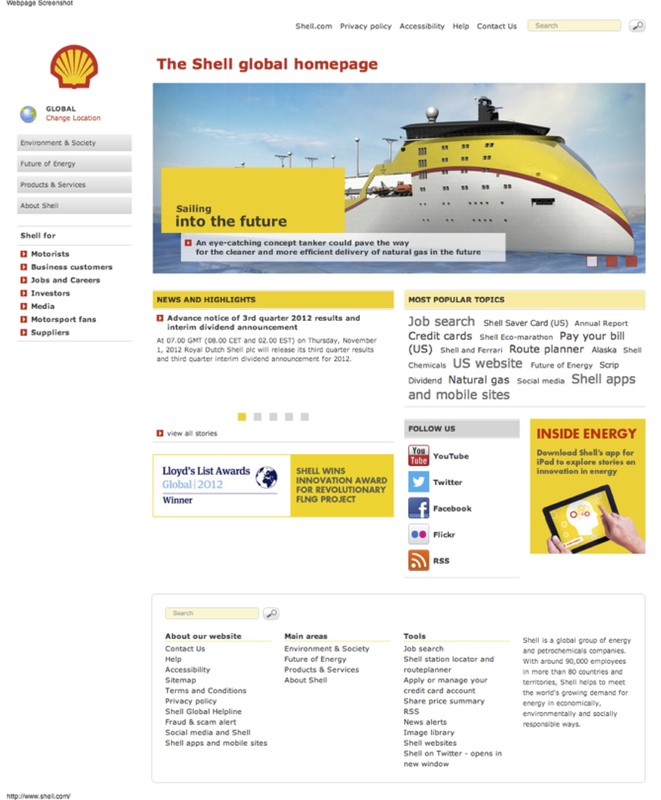 Another example of moving a corporate website from destination to platform is Eni. The Italian multinational oil and gas company provides access to a restricted area to clients, journalists, employees and others. 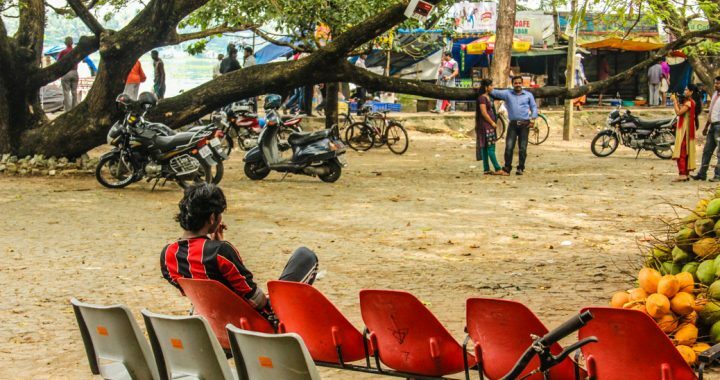 It is not apparent whether the target audience is offered only additional content or whether Eni offers means to its audience to connect and network with each other. As I mentioned before, corporate websites moving from simple destination to becoming a platform is tricky. Putting the technical requirements in place is easy. But nurturing and sustaining a community requires a lot of attention, time and potentially budget. But it is an interesting idea to build closer, emotional relationships between people working at your company and your audience. Summary: Moving ‚from single source of truth to provider of different opinions‘ is the fifth corporate website trend we identified. This post is part of a series of blog posts in which we look at trends for corporate websites. One of the biggest problems with corporate websites is that they are seen as yet another company’s broadcasting channel. No matter the information it will always have the company’s positive spin on it. It was a comfortable position for companies back when corporate websites were the main destination to find information. But these days your audience can get information about your company from a variety of (online) sources. You say you are the best employer in the world? Well, people on Glassdoor say the opposite. You say your CSR campaign is an incredible hit? Well, people in forums and communities beg to differ. No matter what, people will probably trust your content on your website less than other sources. And these days it’s easy to find these sources, so it’s not advisable to bury your head in the sand. To earn the trust of your audience the corporate website will need to move from single source of truth to the provider of different opinions. Corporate websites are starting to provide corporate and non-corporate content, i.e. 3rd party or user-generated content. This is a tall order for most companies, as it can potentially mean losing control of your message if done wrong. Thus, we probably won’t see radical shifts in this trend but slow developments, starting on social media channels, microsites, then brand sites and ultimately corporate websites. One of the simpler and most cost-effective way of providing different opinions is content curation. 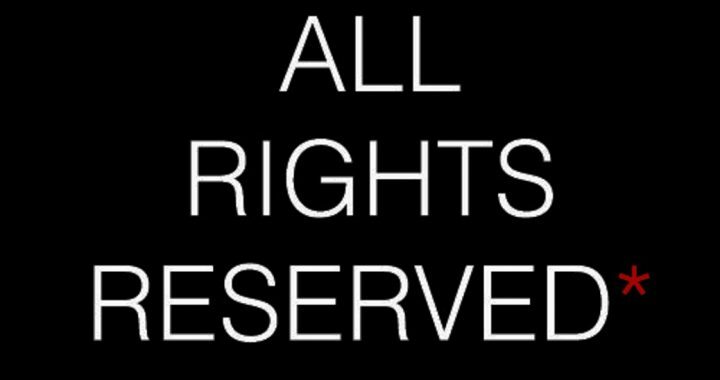 Thus, the corporate website team curates relevant, external content that was not produced by them but 3rd parties. The adidas Group have started doing this with their recent relaunch of their corporate website. 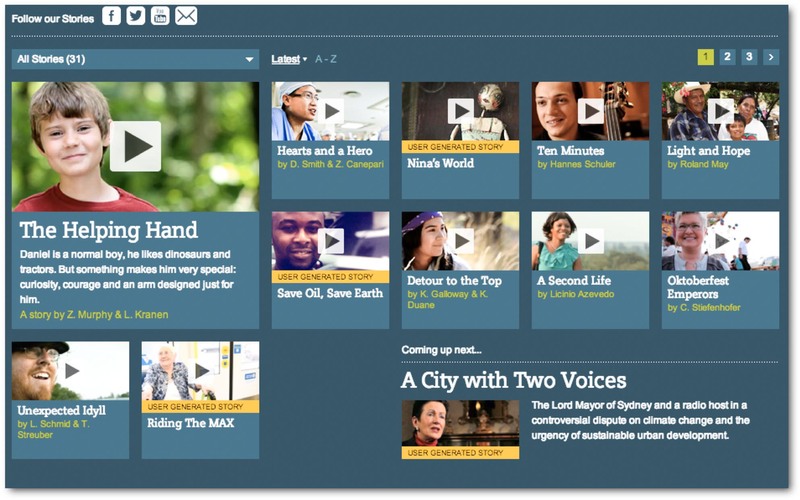 In 2013 Siemens teamed up with Zooppa to crowdsource videos through a contest. Participants were asked to create original footage about inventions that can help us lead a sustainable life in the cities. The requirements of the contest stipulated explicitly that the video must not be Siemens branded. Some of these videos can now be found on the Siemens homepage. They are part of the /answers campaign, which uses storytelling to build an emotional connection between the audience and the company. Siemens understood quite well, that if the content is good, it will speak for itself and spread across the social web. Nice touch, that Siemens could indirectly be associated with the innovation initiative. One interesting way of providing opinions and views from different people is using employees’ tweets. In the end, people connect to people, not companies. 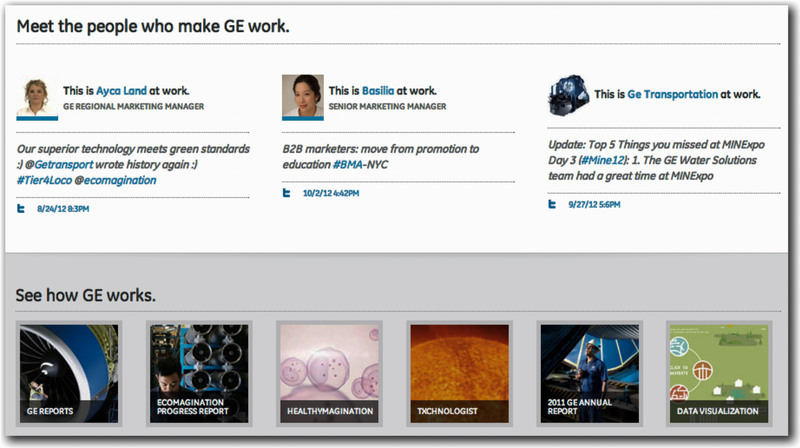 Below you see a screenshot from the General Electric homepage from 2012. It displays tweets from GE employees as well as their picture. Now, I assume that GE has some tools in place to pick the right tweets and to avoid any embarrassing tweets showing up. For writing this blog post I revisited the GE website. GE have now moved employee and non-GE-employee tweets to the Story section. In a sense that is a shame, as those tweets are not front and center anymore. On the other hand, tweets are now embedded into the right context (Link to a GE Story). What is important to understand in a networked world is that we are not dealing with B2B or B2C anymore. It’s all P2P – People to People. People trust people, at least more than they trust companies. Thus, in a sense you don’t want your audience to connect to your company but to the people who run your company including any employee. But organisations can also think beyond their own employees. They could include tweets or other content from analysts, journalists, CSR professionals, partners, sports stars (if for example the brand is in the sports business) etc. A more elaborate and time and cost intensive way of providing different opinions is corporate blogging. Corporate blogs offer an opportunity to provide more informal insights into the company and conversational content if done right. Ideally, employees and managers of the company write interesting blog posts about their work, opinions, insights. If done right, corporate blogs can definitely support marketing and recruitment efforts in an informal and indirect manner. However, companies should consider their audience and effort it takes to make it work! Personally, I like the adidas Group Corporate Blog. It is written by employees and touches on a large variety of topics that are interesting and relevant to me. Opening up the corporate website to non corporate and third-party content is a huge change. But there are a few simple steps that can be taken towards it. In a previous blog post I looked at WHY and HOW managers, especially executive managers, could and should use their company’s enterprise social network or social intranet. In this post I describe WHAT they can do to quickly get started. To make things easy I will refer to enterprise social network and social intranet platforms in generic terms. Some of them may not have the features mentioned below. Some of them, for example IBM Connections, Jive, Yammer, Socialcast, Communote, Chatter and many others, might have, including other relevant features. Every employee should have a profile on platform, which is visible to the entire company. In some cases information is pulled from the Active Directory. In most cases this information is incomplete though. A photo, About Me, Experience and other profile fields are probably missing. 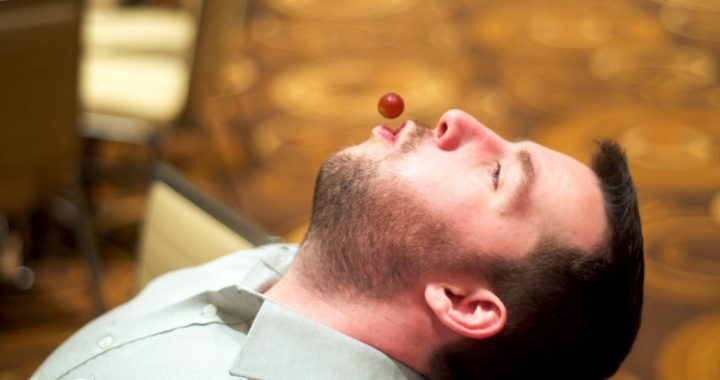 Depending on the platform policy the picture may not need to be a formal corporate photo. Remember being authentic and human! About Me section: Of course, some formal words about the manager, his role but it’s also important to include something interesting that maybe few people knew. Especially managers and executives are often in meetings or on the road. Having easy access to the platform through mobile devices lowers the barrier to participation. Thus, help the manager to download the app or provide other means of mobile access to the platform. In some cases, the app can be pushed to the device beforehand. Once this is done you can start with using the microblogging part. If you have only 30 min, I would focus on this. Few executives will immediately join communities, collaboratively work on documents or want to start a blog. Microblogging is something quick and easy to pick up and can already provide a lot of value. When it comes to the microblogging part it is important to remember the principles of this new way of communicating a – build trust by being visible, authentic, human, valuable and compassionate. To make the microblogging part more tangible for your executive, explain that it is similar to working out loud, i.e. working out loud in public but within the company, of course. ‚Thank you <employee> / <team> for your contribution…‘ or even just by simply liking a status update or comment by other people! This takes about 5 min of your executive’s day but can be invaluable and motivating to his employees. If the executive feels more comfortable, he can also give praise in private channels in the beginning. Even this will show employees that he is actually aware of what is going on in the company. When talking about microblogging you should also introduce @mentions and #hashtags. @mentions are relevant because you can ‚tag‘ people in a post. That means if they are mentioned they will receive a notification. #hashtags are another way of disseminating information on the platform. People can subscribe to #hashtags. Maybe there is a particular hashtag that is relevant for your executive or he would like to introduce, e.g. ‚innovation‘ or some campaign he is responsible for. When you click on a #hashtag people will be able to see all posts to the microblog that have been tagged with the #hashtag. Point out to your executive that he does not need to check the microblogging stream every 10 minutes. Important information and discussions will flow to the top. Too formal updates. Being authentic and human is key. Useless or frequent posts with same content. Just writing ‚I am meeting person x today‘ every day becomes boring over time. More context and variety should be given. Giving up. In the beginning people might be hesitant to interact, especially if they don’t know the executive personally. Some are probably shocked by the fact he is actually reading people’s updates and even responding. That is scary and people need to get used to it. One way of breaking the ice is by being proactive – asking questions and going out to where the people are having conversations. Obviously, your executive should start following all other executives and maybe their reports. Also, he should follow people from his team, people he worked with at the company etc. Explain why he should follow other people and what impact that has on his interaction with the platform. Whilst the above already provides concrete, practical steps to get executives into using your enterprise social network or social intranet by working out loud, you will still need to tweak the messages and steps for your managers. There is lots more that can be done (e.g. particular use cases for executive management) or said depending on the experience, behaviours, requirements of the managers. If your executive needs some more inspiration and convincing, you may want to show him this video of Giam Swiegers, CEO Deloitte Australia talking about his own use of the company’s enterprise social network based on Yammer. 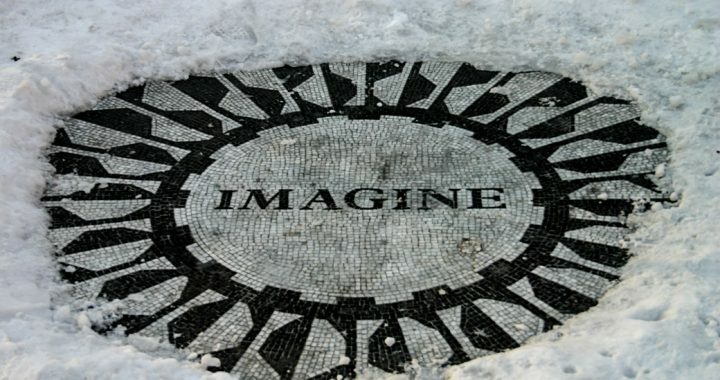 This post is part of the blog parade of the Social Business Arena. Check out other blog posts that deal with the adoption of social tools in the workplace. Summary: Moving ‚from desktop to mobile‘ is the fourth corporate website trend we identified. This post is part of a series of blog posts in which we look at trends for corporate websites. I believe this trend is already well understood and I don’t have to explain it in greater detail. With the omnipresence of mobile devices (smartphones and tablets) people can access information whenever and wherever. This leads to great opportunities. But there are different ways of moving from desktop to mobile. 1) Mobile site or responsive/adaptive design? Some time ago mobile sites of corporate websites were quite common. Most of them look like m.companyname.com. BASF and Siemens are still using this approach. In the past years responsive / adaptive design has climbed the stage and seems to become the default option for organisation currently thinking about relaunching their corporate website. Both responsive and adaptive designs run on one codebase. Responsive web design uses flexible and fluid grids, and adaptive design relays on predefined screen sizes. (this article has more detail on the differences). In both cases though content and navigation are rearranged depending on the screen size of the device used. Shell was one of the early companies to adopt responsive design. Have a look at this article that describes in more detail the differences between a mobile site and one with responsive design. It was to be expected that with the availability of mobile apps, companies would jump on the bandwagon and create such apps. Whether this makes sense or not depends on different factors. Mobile apps can provide a richer feature set and have more access to elements of your smartphone. But most corporate websites only serve static content (for now), which raises the question whether a separate mobile app where content will need to be uploaded separately and versions for different operating systems will need to be developed and maintained, makes a lot of sense. Time will tell. Below is a screenshot of Unilever’s Investor Relations App. It basically provides all the content that can also be found on the corporate website. Additional value seems to be missing, which I believe is a huge drawback. You could imagine expanding this app to include information about Unilever’s Annual General Meetings especially for participants to receive local content and services when attending on site. Companies should always consider things that are useful for the audience, let it be journalists, investors or others. 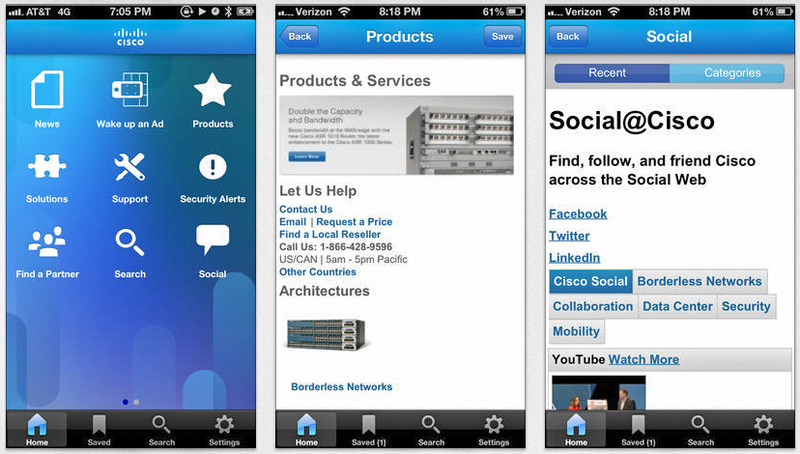 Cisco is taking it slightly further with its mobile app. It offers latest news and promotional offers, videos and podcasts. It also allows users to find events and Cisco partners in their area, local phone number for Cisco support and receive current security alerts, advisories and responses. As you can see, the app provides localised content which might be more useful to users than generic content that can also be found on the corporate website. Thus, the app does not only provide information but also a service. This is another trend for corporate websites that we see and will discuss in a later blog post. How to become a better manager by building trust? One of the key success factors for implementing an enterprise social network, collaboration platform or social intranet is the support from the executive management. Whilst you might have found a (financial) sponsor for your project, it does not always translate into actual use of the platform by the sponsor. However, if they don’t walk the talk, you face a long and painful uphill struggle culturally implementing the platform and ideas for new ways of working. I hear too often from executives that the new enterprise network or social Intranet is for employees but not for them. Employees should use the platform to connect, communicate and collaborate for the better of the firm. The apparent ignorance stems from the fact that executives do not properly understand how they can make use of the tools themselves, even though these tools offer tremendous value to executives, too! As for anyone, it comes down to the question: Why should I use it? By using an enterprise social network and working out loud employees can build their own brand and take control of their career path. Managers*, including executive managers, can use such tools to become a better manager. There are few people who will admit that they are not interested in their own career or to be a good manager. In both cases we are talking about intrinsic motivation, which is more powerful and sustainable than extrinsic motivation. Thus, in your communication you should stress the point about becoming a better manager. To drive home the point about the importance of being a good manager, you may remind them that employees usually don’t leave companies. They leave their leaders / managers. Besides, employee engagement is at its lowest point, poor managers being one of the root-causes. Edelman, a leading digital agency, called 2013 the Crisis of Leadership. I believe it’s far from over. In Edelamn’s latest Trust Barometer report CEOs are still one of the least trusted people. Visible: It used to be the case that managers were able to walk the (factory) floor and talk to employees directly. These interactions and relationships built trust. Nowadays, a distributed workforce makes this a huge challenge for any executive. The higher up the hierarchy the less visible and accessible managers become. Using an enterprise social network allows managers and leaders to be visible to employees again due to the transparency and scalability these technical platforms offer. Executives can get an unfiltered (by middle managers) view on what is going on within the company. Being visible on the enterprise network usually doesn’t take more than 15 to 20 min a day. Authentic: It’s important that executives speak with his own voice. They must not let their assistants or Internal Communication managers do the talking on the platform. Otherwise, it is just another comms exercise. In that case, they executives might as well send a pre-written and approved email to employees. Human: People trust people, especially if they know each other. The higher up a manager sits though, the less he knows his employees on the ground. Managers need to be approachable even by lower ranked employees that don’t have constant contact with higher level managers. 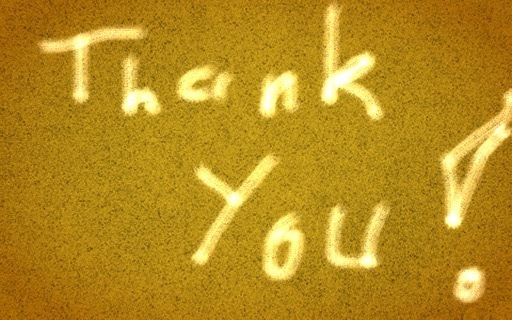 Sometimes sharing something personal, makes us human and thus approachable and likeable. Valuable: It’s important to provide value to people who might follow the executive’s updates on the enterprise social network or social intranet. Similar to Twitter, just sharing what you had for lunch and that you are going to the loo is probably less interesting to people. Be interesting! Compassionate: Showing that you care, makes you more human and again approachable and likeable. Besides being interesting, you should in first instance be interested! Listening to what employees are saying is crucial. Joining the conversation with short comments or ‚like‘ or ‚thank you‘ clicks is quick and easy to show interest and appreciation and will go a very long way. A fellow Change Agent, Simon Terry, arrived at a very similar list of traits that managers need to adopt in a networked company. In this post I discussed the WHY and HOW executive management could and should make use of the company’s enterprise social network or social intranet. In a follow-up post I will discuss WHAT the executives can do to get started. *For simplicity’s sake I am using ‚manager‘ and ‚leader‘ synonymously in this blog post, as the content discussed here applies to them in almost equal weight. However, it is understood that there is a difference between the concepts of ‚manager‘ and ‚leader‘. Summary: Moving ‚from text to active content‘ is the third corporate website trend we identified. This post is part of a series of blog posts in which we look at trends for corporate websites. When companies started to flock to the WWW things were simple. They set up their corporate website, digitialised their content and done. Back then the WWW felt like a channel. Today it has become a canvas. With the proliferation of social media, companies now need to think multi-channel. There is a plethora of services that organisations can use to expand their digital footprint. To make things even more complicated HR, Marketing, Customer Service, External Communication departments and others could all potentially leverage social media channels to address particular business needs creating their own channels. At times this can also lead to confusion for customers and inefficiencies for organisations. What is clear is that social media channels cannot and must not replace the corporate website. In fact, they complement each other. In the beginning companies were driving their audience towards their social media channels to be able to engage with them in better ways. But soon companies were unnerved by the frequent changes made by behemoth like Facebook or services that came and went like Posterous that was used for content curation. A better way is to leverage the size of existing and successful social media channels and services to reach larger audiences but aggregate the content and to a certain extent activity on the corporate website to drive traffic back to a place that is owned by the company. In this series I normally try to highlight good examples of the corporate website trends that we see. In this case I rather start off with a poor example, simply because it’s an easy mistake to make and I have seen it quite often. Whilst linking to social media is easy, the integration often looks basic at best and irrelevant at worst. 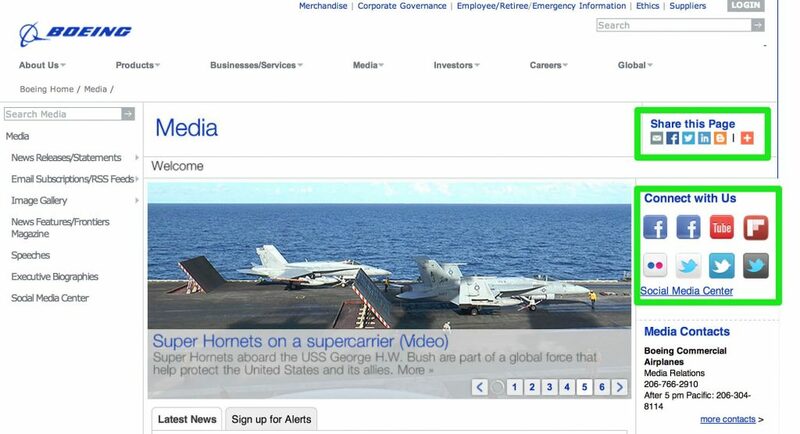 Boeing’s corporate website is a particular poor example. On the Media page we see a number of sharing options. It breaks the layout and looks cheap. But the real question is: Does anyone use the sharing functionality? The ‚Connect with Us‘ widget on Boeing’s corporate website is equally challenging. In this particular case the reader is confronted with two FB channels, three Twitter channels. There is no tool tip to understand which channel is what. Luckily, these widgets do not appear on every page of the website! As mentioned before companies should identify relevant channels to leverage their network and scale. For example, many companies already rely heavily on YouTube to host and distribute content. Procter & Gamble use YouTube primarily for storytelling, Nestle has a separate Investor Relations channel, whilst Deutsche Telekom tries to represent the entire company on YouTube. Another distribution network is Flickr, a photo-sharing website. Deutsche Bank have had a presence on Flickr since 2009 to host its own photos but also link to photos from other Flickr users. I am yet to find a company that has started hosting all their media assets (e.g. pictures of premises, board members, logos etc.) on Flickr. But maybe it will happen one day. Slideshare is potentially another interesting channel to host for example slides, webcasts of a company’s annual general meetings or other relevant content. BASF has been using Slideshare for the past three years now. With this proliferation of external channels, the corporate website needs to become a platform to aggregate them. Some companies don’t dare to touch the traditional newsroom and instead create a separate subsite to aggregate social media content. Here is an example from Lufthansa. But some companies also try to extend the traditional media newsrooms to include the company’s social media channels. Integration efforts vary between simple linking and pulling in content either via API or widgets. 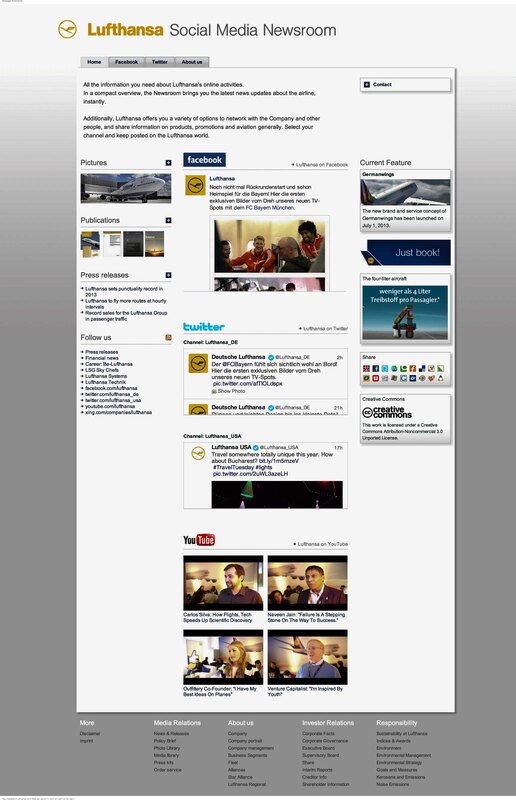 SAP uses a hybrid approach and links to social media channels but also displays a Twitter feed. Also, have a look at Microsoft Germany and Pfizer as they try to break down the silo between traditional and social media newsrooms. However, their integrations look cheap and poor breaking the look & feel of the site. Scania Group have done a better job in this case, especially with pulling in photos from Flickr and videos from YouTube. Incorporating social media channels in a corporate website is a good start to position the corporate website as a platform rather than single channel. But I believe we haven’t seen the most interesting use cases yet. For example, LinkedIn offers a plugin that allows career seekers and other users coming to a company’s website to see who in their LinkedIn network works at that company. 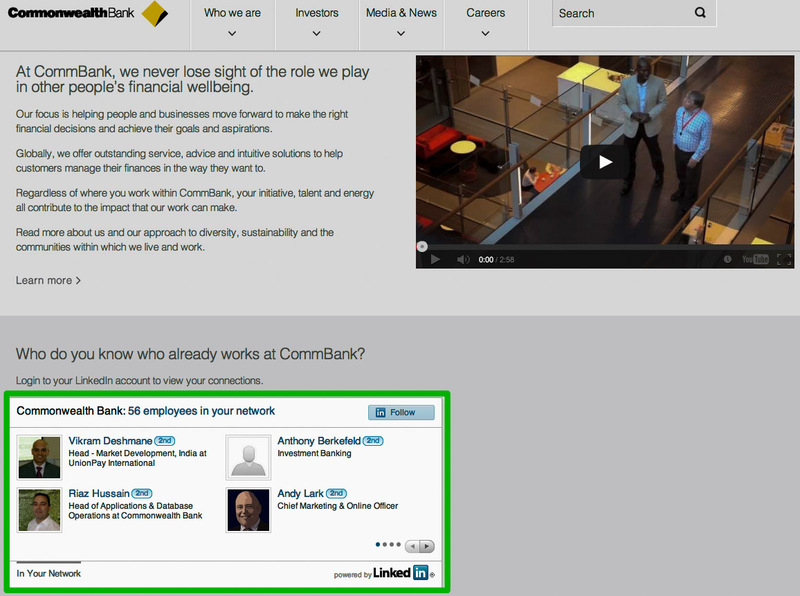 The Commonwealth Bank is the only organisation I have seen making use of the LinkedIn plugin. Even without checking LinkedIn the plugin already showed me that I have 56 people in my network that could introduce me to employees working at the bank. Furthermore, I believe that companies should not only look at external social media channels to hook up with their website. Many companies have created communities, enterprise social networks, blogs etc. behind the firewall. Exposing some of that content with as little friction as possible on the corporate website would be a win for transparency for the company and readers. Given the plethora of social media tools and the value they can potentially add for a company, companies will not get around them easily. If they do extend their digital footprint though, they will need a comprehensive strategy and how to tie them all together. The corporate website can serve as an excellent platform.